Meet Bib Filbon and Jeff Bladt who have the job title, “Data Scientist,” and are on staff at DoSomething.Org. They work in partnership with DoSomething’s program staff to collect, analyze, and make sense of data to improve impact of DoSomething’s programs. DoSomething.org does not consider this overhead. Building infrastructure, in-house expertise, and data literacy of all staff is critical to their success so they have invested. The challenge is to better convey the value of measurement to funders. 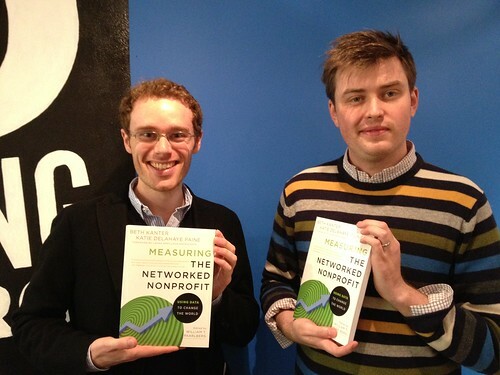 All of us, like you’ve done with your book, need to provide solid, tangible demonstration of the value of high performance, based on measurement, that is done by the nonprofits themselves — and which is separate and distinct from third-party evaluations and external methods to assess or rate nonprofit performance. The irony is that if nonprofits had good measurement systems in would enrich third-party evaluations and external rating approaches! Kris Moore, Karen Walker, and David Murphey of Child Trends, expresses this well in this chapter from Leap of Reason — Performance Management: The Neglected Step in Becoming an Evidence-Based Program. Mario’s last point is something that I’ve wondered about in a recent guest post, “Doing the Math Ourselves” over at the Markets for Good site. What are the skills and mindsets that nonprofits need to embrace data for social change? What are the types of funding and capacity building that philanthropy should support to make this happen? Sadly, some funders are currently playing the role of supporting BAD measurement. Some funders ask for reports showing the number of volunteer hours and more is always consider better. This creates pressure on managers of volunteers to increase the number of hours volunteered continually, without a correlated look at what outputs are generated with those hours. “How many hours did we get from volunteers?” is the wrong question, but sadly, it’s the one on which the sector is currently focused. The right question is “What is the relationship between the number of hours of volunteer time that we consumed related to the value of what we accomplished?”.